Eastern Curve Garden's big bad neighbour is back! 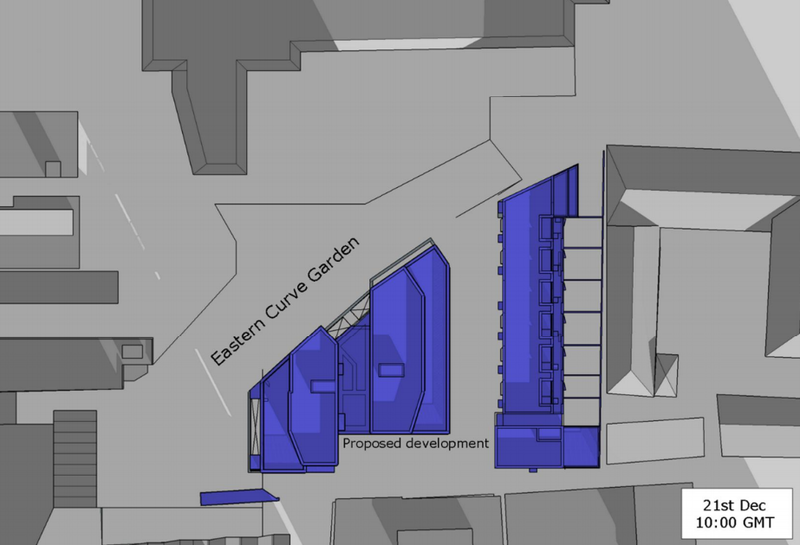 You may recall the outcry last spring about a big bad development which would cast our community Eastern Curve Garden into shade. We wrote about it here. The planning application was later withdrawn but, after some minor design changes, it is now very much alive again. 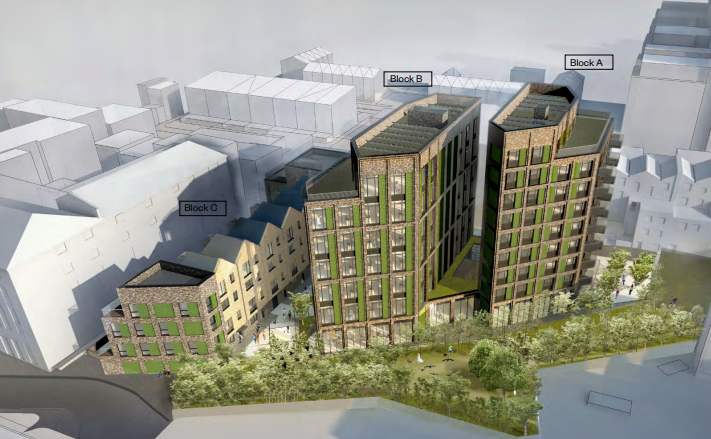 The original application for re-development was for 3 blocks of 9 storeys, 8 storeys and 4 storeys containing 39 flats and 4,209m2 of commercial floor space. Now the two tallest block have been reduced by one storey each to 8 and 7 storeys to make them "policy compliant". 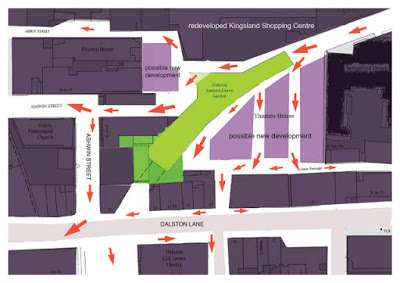 The Dalston Area Action Plan (page 32) envisages six-storey buildings for this site "punctuated by taller building elements where appropriate" not exceeding 8 storeys. This image shows the newly amended plans Thames House scheme. This view is looking south, with the Eastern Curve Garden in the foreground. The planned buildings will block sunshine from the east and south to the Garden. A proportion of the new homes within the densely packed development will also be below standards for natural light. This computer modelled image shows the average annual shadows which will be cast at 10am by the new Thames House development (shown in blue). In winter months, when the sun is lower in the sky, the Garden will get very little sunlight during the day at all. The developer says the one-storey height reductions will "minimise the impact on the Eastern Curve Garden". It will not. 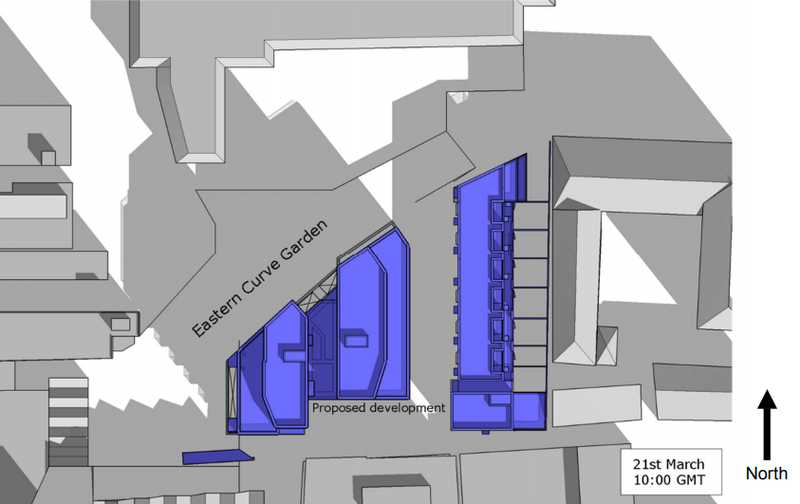 The new buildings will be so tall that the shadows will extend way beyond the Garden.The Council's own consultants, BRE, predicted that, under the 2017 scheme, the Garden could still receive, on average over the year, at least 2 hours sunlight a day over 78% of its area With the new 2018 building height reductions, the BRE now predict that that area will increase by only 1.7% to 79.7%. With 75% of Hackney children living in flats without gardens, and a desperate shortage of green space locally, the Garden meets a special public need. Sunlight is so important to the childrens' play space as well as to the Garden's horticultural and cultural activities. Beware - we know from experience that the Council does not value sunlight for our kids! It could well recommend that the overshadowing is acceptable because the BRE's guidelines for open space requires only a yearly minimum average of 2 hours sunlight over 50% of open space. 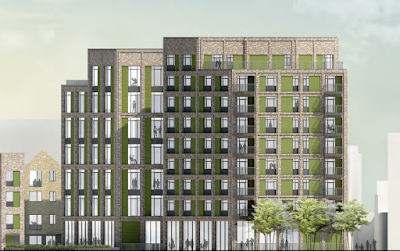 The new blocks will be stacked up so tightly into the Thames House site itself that, in the low rise block which has the social rented family homes, 75% of kitchens, 45% of the bedrooms, 20% of the living rooms would fail to meet the BRE minimum guidelines for internal natural light. The developers claim that the sub-standard natural light to its new dwellings are because neighbouring Springfield House is so tall and built right on its boundary, such that it is a "bad neighbour". With Springfield House on the left, this view is of the Thames House development, as it will appear from the Matalan car park. lt will infill the final vacant air space and block out the remaining sunlight along the Eastern Curve public footpath. 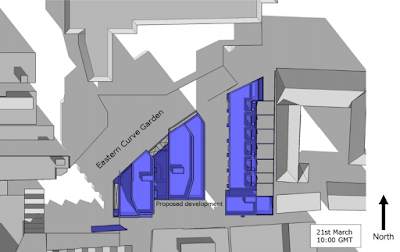 The Thames House development is itself a "bad neighbour" to the Eastern Curve Garden, because the two tallest blocks will still extend like a cliff right along the Garden's southern boundary and are predicted to obstruct most of its existing morning and significant afternoon sunlight, making it colder and damp. The BRE does not comment on the open spaces within the Thames House site itself, but its shadow plots illustrate that they rarely receive any direct sunlight and so they will also be cold, damp and gloomy too. All these factors indicate over development of the site. 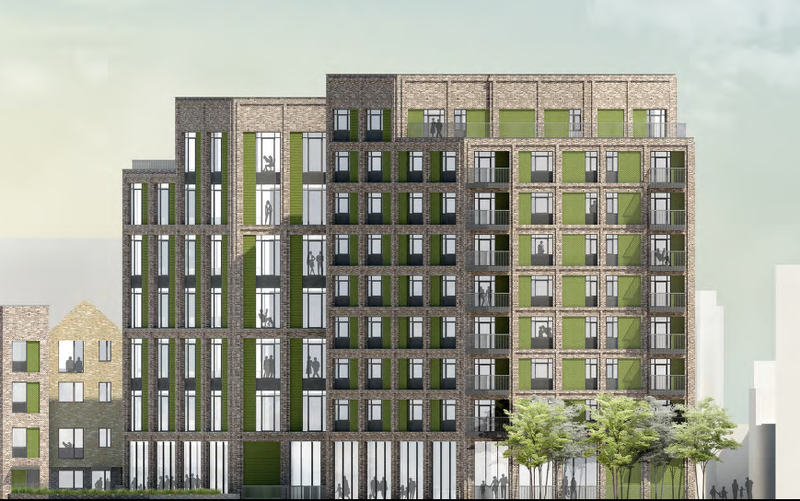 In other respects Hackney have insisted that the development should meet policy requirements - for example the site is within the local "employment priority area" and 3,968sqm (51%) will be for office space (Although only 10% of it will be "affordable". Ed.) and, of the 36 new flats, 7 flats will be for "affordable" sale and 11 for "affordable" rent ( But probably not affordable to local residents on average incomes. Ed.). 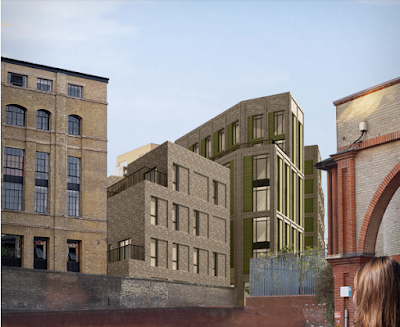 The developer has also claimed its designs respond to the extended conservation area by using decorative features like green glazed and stock brick cladding and decorative metal panels (But will they actually appear on the finished buildings? Elsewhere locally approved decorative panels have later been replaced by bland brickwork Ed.). The Garden is presently designated as a temporary amenity with future use of its land for a pedestrian "shopping circuit" along the Eastern Curve linking Dalston Lane with a planned redevelopment of Kingsland Shopping Centre. But even as a public thoroughfare, with ( hopefully) planned green areas and kids play areas, the open space will need adequate sunlight. This illustration shows how, by comprehensive planning with adjoining landowners, pedestrian movement within the area could be improved without the need to use the Garden land as a thoroughfare. 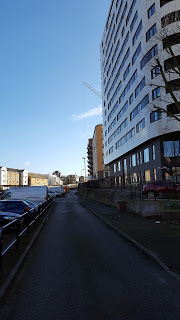 The Eastern Curve public walkway, extending from beyond the Garden around to Dalston Lane, is already cold and gloomy with very little sunlight and with accelerated winds due to the effect of the towers. The developer has acknowledged that in earlier consultation events the key public concerns, whilst welcoming the high proportion of "affordable" housing, were the negative impact on the Eastern Curve Garden, the height and density of the scheme and the poor natural light to many flats. These concerns have not been mitigated by any significant changes to the design of the Thames House development. The public's concerns have been ignored in favour of maximising the development potential of the site. You can find the Thames House planning application and documents under reference 2017/0320 and comment on-line there. 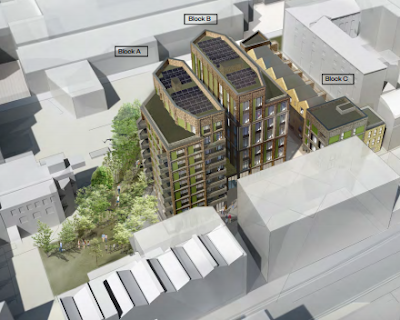 You can read OPEN's objections to the amended 2018 Thames House scheme here. You can also make your views known to Hackney by email to planning@hackney.gov.uk with reference 2017/0320 in the Subject line. (Numbers count so even a short objection can make a difference. Ed.). 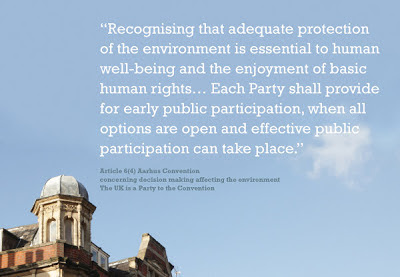 The public consultation officially closes on 5th March, so don't delay. However, until the Planning Committee's decision is made, it's never too late. All public comments received by the planners must be reported to Hackney's planning committee prior to it making a decision.